NOAM CHOMSKY, world-renowned linguist, political analyst, philosopher and activist, has been called "arguably the most important intellectual alive" by the New York Times. Recently, in a British magazine poll, he has been voted by a landslide as the top public intellectual in the world today. According to the Arts and Humanities Citation Index, between 1980 and 1992 Chomsky was cited as a source more often than any other living scholar, and remains the eighth most cited scholar ever. A professor at MIT, he is the author of more than 80 books, including The New Military Humanism: Lessons From Kosovo. His most recent book is Failed States: The Abuse of Power and the Assault on Democracy. Danilo Mandic: Professor Noam Chomsky, in your, if I am not mistaken, first TV media appearance for Serbian media, thank you very much for being with us. Noam Chomsky: I am glad to be with you. [b] Last month marked the seventh anniversary of the beginning of the bombing of Yugoslavia. Why did NATO wage that war or I should say why did the United States wage that war? [/b] Actually, we have for the first time a very authoratative comment on that from the highest level of Clinton administration, which is something that one could have surmised before, but now it is asserted. This is from Strobe Talbott who was in charge of the…he ran the Pentagon/State Department intelligence Joint Committee on the diplomacy during the whole affair including the bombing, so that's very top of Clinton administration; he just wrote the forward to a book by his Director of Communications, John Norris, and in the forward he says if you really want to understand what the thinking was of the top of Clinton administration this is the book you should read and take a look on John Norris's book and what he says is that the real purpose of the war had nothing to do with concern for Kosovar Albanians. It was because Serbia was not carrying out the required social and economic reforms, meaning it was the last corner of Europe which had not subordinated itself to the US-run neoliberal programs, so therefore it had to be eliminated. That's from the highest level. Again, we could have guessed it, but I've never seen it said before. That it wasn't because of the Kosovo Albanians, that we know. And this is a point of religious fanaticism that the West can't talk about for interesting reasons having to do with Western culture, but there is just overwhelming documentation, impeccable documentation. Two big compilations of the State Department trying to justify the war, the OSCE records, NATO records, KIM Monitor records, long British Parliamentary inquiry which led into it. They all showed the same thing - and sort of what we knew, I mean it was an ugly place, there were atrocities there. …in the United States and in the West in general, because reviewing it you would get the impression - you would be forgiven for imagining that every critic of the NATO intervention was one of two things: either a "Milosevic sympathizer" or someone who doesn't care about genocide. What does this mean? First of all that's a common feature of intellectual culture. One good U.S. critic, Harold Rosenberg once described intellectuals as the "herd of independent minds." They think they are very independent but they are a stampede in a herd, which is true; when there is a party line, you have to adhere to it and the party line is systematic. The party line is subordination to state power and to state violence. Now you are allowed to criticize it but on a very narrow grounds. You can criticize it because it is not working or for some mistake or benign intentions that went astray or something, like you see right now in Iraq war, the tone of debate about Iraq war but take a look at it - it's very similar to the debate in PRAVDA during the invasion of Afghanistan. Actually I brought this up to a Polish reporter recently and I asked him if he had been reading PRAVDA. He just laughed and said yeah it's the same. Now you read PRAVDA in the nineteen eighties, it's you know: "the travail of the Russian soldiers that are going to get killed and now there are these terrorists who prevent us from bringing justice and peace to the Afghans, we of course did not invade them, we intervened and helped them at the request of the legitimate government, the terrorists are preventing us from doing all good the things we wanted to do etc." I have read Japanese counter-insurgency documents from the second WW, from the ninety thirties - the same, you know: "...we tried to bring them an earthly paradise, but the Chinese bandits are preventing it ..." in fact I don't know of any exception in history. If you want, British imperialism is the same, I mean even people of the highest moral integrity like John Stewart Mill were talking about, well we have to intervene in India and conquer India because the barbarians can't control themselves, there are atrocities, we are to bring them the benefits of the British rule and civilization and so on. Now in the United States it's the same. Now take bombing of Kosovo; that was an incredibly important event for American intellectuals and the reason it had to do it all was for what was going on during nineties. And the nineties are for the West, not just the U.S. and France and England were the worst - probably the low point in intellectual history for the West, I think. I mean it was like a comic strip mimicking a satire of Stalinism, literally. You take a look at the New York Times or read the French press, the British press, there was all full of talk about how there is a "normative revolution" that has swept through the West, for the first time in history, a state namely the United States, "the leader of the free world" is acting from "pure altruism", ...Clinton's policy has entered into a "noble phase," with a "saintly glow" on and on, I am quoting from the liberals. Right. And it was specific in a sense because it was based on the claim that it was preventing genocide. Now this is, see there are no examples yet. Let me just read something that you said in an interview around the time of the bombing. You said that "the term "genocide" as applied to Kosovo is an insult to the victims of Hitler. In fact, it's revisionist to an extreme." What did you mean by that? First of all let me just fix the timing. The things I've been quoting are from the late nineties. Yeah. Now, they needed some event to justify this massive self-adulation, OK? Along came Kosovo fortunately and so now they had to stop genocide. What was the genocide in Kosovo? We know from the Western documentation what it was. In the year prior to the bombing, according to Western sources about two thousand people were killed, the killings were distributed, a lot of them were coming in fact according to British government, which was the most hawkish element of the Alliance, up until January 1999 a majority of killings came from the KLA guerillas who were coming in as they said, you know, to try to incite a harsh Serbian response, which they got, in order to appeal to Western humanitarians to bomb. We know from the Western records that nothing changed between January and March, in fact up until March 20 they indicate nothing. March 20th they indicate an increase in KLA attacks. But, it was ugly but by international standards it was almost invisible unfortunately and it was very distributed. If the British are correct, the majority was coming from the KLA guerillas. And as it later turned out the KLA was also receiving financial and military support. They were being supported by CIA in those months. And to call that genocide, is really to insult the victims of the holocaust, you know, if that's genocide than the whole world is covered with genocide. In fact it's kind of striking; right at the same time the Western intellectuals were praising themselves for their magnificent humanitarianism, much worse atrocities were going on right across the border, in Turkey. That's inside NATO, not at the borders of NATO… "how can we allow this on the borders of NATO,"… but how about inside NATO where Turkey was carrying, had driven probably several million Kurds out of their homes, destroyed about 3500 villages laid waste the whole place, every conceivable form of torture and massacre you can imagine, killed nobody knows how many people, we don't count our victims, tens of thousands of people, how they were able to do that? The reason is because they were getting 80% of their arms from Clinton and as the atrocities increased, the arms flow increased. In fact in one single year, 1997, Clinton sent more arms to Turkey than the entire Cold War period combined! Up until the counter-insurgency. That was not reported in the West. You do not report your own crimes, that's critical. And right in the midst of all of this, "how can we tolerate a couple of thousand people being killed in Kosovo, mixed guerillas and ..." In fact the 50th Anniversary of NATO took place right in the middle of all of this. And there were lamentations about what was going on right across NATO's border. Not a word about the much worse things going on inside NATO's borders, thanks to the massive flow of arms from the United States. Now that's only one case. Comparable things were going on all over where the U.S. were supportive of much worse, but this, you had to focus on this, that was the topic for "the herd of independent minds." It played a crucial role in their self image because they had been going through a period of praising themselves for their magnificence in their "normative revolution" and their "noble phase" and so on and so forth, so it was a god-sent, and therefore you couldn't ask any questions about it. Incidentally the same happened in the earlier phase of the Balkan wars. It was awful, and so on and so forth. However, but if you look at the coverage, for example there was one famous incident which has completely reshaped the Western opinion and that was the photograph of the thin man behind the barb-wire. A fraudulent photograph, as it turned out. You remember. The thin men behind the barb-wire so that was Auschwitz and 'we can't have Auschwitz again.' The intellectuals went crazy and the French were posturing on television and the usual antics. Well, you know, it was investigated and carefully investigated. In fact it was investigated by the leading Western specialist on the topic, Philip Knightly, who is a highly respected media analyst and his specialty is photo journalism, probably the most famous Western and most respected Western analyst in this. He did a detailed analysis of it. And he determined that it was probably the reporters who were behind the barb-wire, and the place was ugly, but it was a refugee camp, I mean, people could leave if they wanted and, near the thin man was a fat man and so on, well and there was one tiny newspaper in England, probably three people, called LM which ran a critique of this, and the British (who haven't a slightest concept of freedom of speech, that is a total fraud)…a major corporation, ITN, a big media corporation had publicized this, so the corporation sued the tiny newspaper for lible. Now the British libel laws were absolutely atrocious. The person accused has to prove that the, what he's reporting is not done in malice and he can't prove that. So and in fact when you have a huge corporation with batteries of lawyers and so on, carrying out a suit against the three people in the office, who probably don't have the pocket-money, it's obvious what is going to happen. Especially under these grotesque libel laws. So yes, they were able to prove the little newspaper…and couldn't prove it wasn't done out of malice, they were put out of business. There was just euphoria in the left liberal British press. You've read The Guardian and The Observer, they thought it was wonderful. Sorry, incidentally..., after they put the newspaper out of business under this utterly grotesque legal case of the British laws, the left liberal newspapers, like The Guardian were just in a state of euphoria about this wonderful achievement. They had managed to destroy a tiny newspaper because it questioned some image that they had presented and they were very proud of themselves for it, which was probably misunderstood or misinterpreted. After the bombing. The way it's presented is: the atrocities took place and then we had to bomb to prevent genocide, just inverted. The bombing, which was also overlooked or selectively covered by the Western media in general. Now, Amnesty International, among others, reported that "NATO committed serious violations of the rules of war during its campaign", numerous human rights groups concur and document various war crimes. One of them had its anniversary two days ago, when the Radio Television Serbia was bombed, the national television, its headquarters, killing 16 people. First of all, why were these crimes completely unreported, and secondly, is there any prospects for there being any responsibility taken for these crimes? ... was invasion of Falluja. Al Jazeera's one thing, but there was worse. The invasion of Falluja was kind of similar to Srebrenica, if you look, but ... They invaded Falluja; the first thing the invading troops did, U.S. troops, was to take over the general hospital and throw the patients on the floor, they were taken out their beds, put on the floor, hands tied on their backs, doctors thrown on the floor, hands on their backs, it was a picture of it in the front page of the The New York Times, they said it was wonderful. It's a grave breach of the Geneva Conventions and George Bush should be facing the death penalty for that, even under the U.S. law. But it was presented, no mention of the Geneva Conventions, and it was presented as a wonderful thing, because the Falluja general hospital was a "propaganda center," namely it was releasing casualty figures, so therefore it was correct to carry out a massive war crime. Well, the bombing of the TV station was presented the same way. In fact, as I'm sure you recall, there was an offer from NATO that they would not bomb if they agreed to broadcast six hours of NATO propaganda. Well, this is considered quite right. A group of international lawyers did appeal to the International Tribunal on the Yugoslavia. They presented a brief, saying they should look into NATO war crimes, but what they cited was reports from Human Rights Watch, Amnesty International and admissions by the NATO command. That was what they presented, the…I am forgetting, but I think it was Karla Del Ponte at the time; she would not look at it, in violation of the laws of the Tribunal, because she "had faith in NATO." And that was the answer. Which also rejected the case. The Court accepted it and in fact deliberated for a couple of years it may still be, but what is interesting is that the U.S. excused itself from the case and the Court accepted the excuse. Why? Because Yugoslavia had mentioned the Genocide Convention and the U.S. did sign the Genocide Convention (after forty years), it ratified it, but it ratified it with reservation, saying "inapplicable to the United States". So in other words, the United States is entitled to commit genocide, therefore and that was the case that the U.S. Justice Department of President Clinton's brought to the World Court and the Court had to agree. If a country does not accept World Court jurisdiction, it has to be excluded, so the U.S. was excluded from the trial, on the grounds that it grants itself the right to commit genocide. Do you think this was reported here? ...for several years they were deliberating but that's the sequence, does any of this get reported? You can ask your friends at Princeton, ask the faculty. They don't know. I mean these… any more than… they will know that, they sort of probably remember the bombing, the capture of the General Hospital in Falluja but, was there any comment saying that was a war crime? What struck me was that you compared the Srebrenica massacre with the Falluja invasion, why is that? In the case of Srebrenica women and children were trucked out and then came, you know, the massacre. In the case of Falluja, the women and children were ordered out, they weren't trucked out, they were ordered out, but the men weren't allowed to leave and then came the attack. In fact, it turned out that the roads out were blocked. Well, I mean all things, it's not the same story, but that part is similar. I actually mentioned that a couple of times. Storms of protest hysteria, you know. Incidentally this Guardian affair - part of it which was totally fraud is on the part of the editors, not the reporter. They blamed it on the reporter, but it was the editors. Unpublished, came out in his unpublished papers, thirty years later. In it what he said is, Animal Farm is a satire of this totalitarian state, he said free England is not very different. In free England unpopular ideas can be suppressed without the use of force and he gave examples. It's very similar here. And it does not matter how extreme they are, I mean the Iraq invasion is a perfect example. There is not, you can not find anywhere in the main stream a suggestion that it is wrongful to invade another country. If you had invaded another country you have to pay reparations, you have to withdraw and the leadership has to be punished. I mean, and I don't know if you have read the Nuremburg Judgments, but after the Nuremburg Judgments, Justice Jackson, Chief of Council of Prosecution of the U.S. Justice, made very, very eloquent statements about how we must…we are sentencing these people to death of the crimes for which they committed or crimes when anybody commits them, including when we commit them, we have to live up to that. He said "we are handing the defendants a poison chalice, and if we sipped from this chalice we must be treated the same way." Can't be more explicit! They also defined aggression. Aggression was defined in terms which just apply absolutely and without exception not only to the invasion of Iraq but to all sorts of other invasions, in Vietnam and many others, actually even terrorist war against Nicaragua, technically falls under the crime of aggression as defined in Nuremburg. 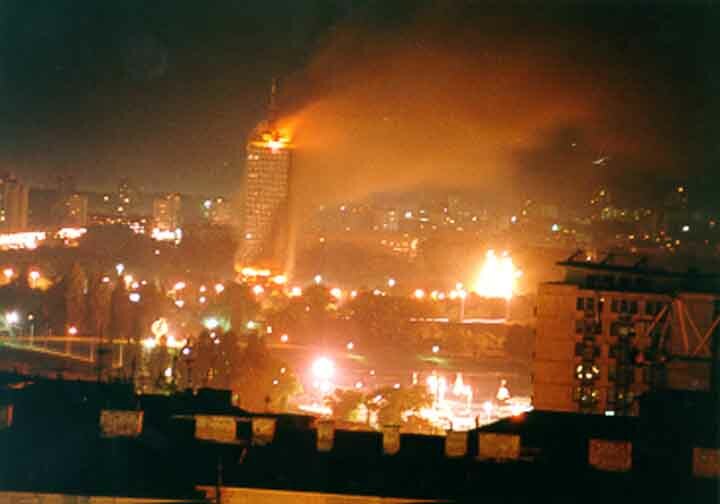 Does the NATO bombing of Yugoslavia? Yes. And that's not even questioned. In fact there is a, there was a so-called, an Independent Commission of Inquiry on the Kosovo bombing led by a very respected South African jurist - Justice Goldstone - and they concluded that the bombing was, in their words, "illegal but legitimate". Illegal makes it a war crime. But they said it was legitimate because it was necessary to stop genocide. And then comes the usual inversion of the history. Actually, Justice Goldstone who was a respectable person, later recognized that the atrocities came after the bombing. And that they were furthermore the anticipated consequence, he did recognize that in a lecture in New York, couple of years ago, he said: "well, nevertheless we can take some comfort in the fact that Serbia was planning it anyway, and the proof for they were planning it is" guess what - "Operation Horse-Shoe", - a probable intelligence fabrication that was publicized after the bombing, so even if it was true, it wouldn't matter. And furthermore, even if that was true, it was a contingency plan. Now look, Israel has a contingency plans to drive all the Palestinians out of the West Bank if there is a conflict, so does that mean that Iran has the right to bomb Israel? Now, the U.S. has contingency plans to invade Canada, OK so does that mean that everybody has a right to bomb the United States? I want to ask you about some of the present developments that are being used again to fabricate a lot of these issues. Slobodan Milosevic died last month. What is the significance of his death in your view? But almost the entire indictment was for after the bombing. How are those charges going to stand up unless you put Bill Clinton and Tony Blair on the dock alongside? Then they realized that it was a weak case. So they added the early Balkan wars, OK? Lot of horrible things happened there. But the worst crime, the one that they were really going to charge him for that genocide was Srebrenica. Now, there is a little problem with that: namely there was an extensive, detailed inquiry into it by the Dutch Government, which was the responsible government, there were Dutch forces there, that's a big, you know, hundreds of pages inquiry, and their conclusion is that Milosevic did not know anything about that, and that when it was discovered in Belgrade, they were horrified. Well, suppose that had entered into the testimony? Does this mean that you are a "Milosevic sympathizer"? No, he was terrible. In fact he should have been thrown out, in fact he probably would have been thrown out and in the early nineties if the Albanians had voted, it was pretty close. He did all sorts of terrible things but it wasn't a totalitarian state, I mean, there were elections, there was the opposition, a lot of rotten things, but there are rotten things everywhere and I certainly wouldn't want to have dinner with him or talk to him, and yes, he deserves to be tried for crimes, but this trial was never going to hold up, if it was even semi-honest. It was a farce; in fact they were lucky that he died. Because they did not have to go through out the whole trial. Now they can, you can build up an image about how he would have been convicted as another Hitler. But now they don't have to do it. I just want to bring you back to the bombing of the RTS. Some have argued that this particular act of NATO's in 1999 set precedants for targeting of media by the United States afterward - in the wars in Afghanistan and Iraq - that it set a precedant for legitimizing media houses and labeling them as propaganda in order to bomb them in U.S. invasions. Do you make any connection there? Well, I mean, the chronology is correct. But I don't think they need excuses. The point is: you bomb anybody you want to. Let's take 1998, so it was before. Now in 1998, here's another thing you're not allowed to say in the States and the West that leads to hysteria, but I'll say it - in 1998 Clinton bombed the major pharmaceutical plant in the Sudan, OK? That was, this is the plant that's using the most of the pharmaceuticals and veterinary medicines for poor African country that's under embargo, can't replace it. What's that going to do? Obviously they killed unknown numbers of people, in fact the U.S. barred an investigation by the UN so we don't know and of course you don't want to investigate your own crimes, but there were some evidence. So the German Ambassador, who is a fellow at the Harvard University to Sudan wrote an article in Harvard International Review in which he estimated the casualties in the tens of thousands of deaths. The research of the Head of the Near East Foundation, a very respectable foundation, their regional director had field work in Somalia and in Sudan, he did the study, he came out with the same conclusions, probably tens of thousands of dead. Right after the bombing, within weeks, Human Rights Watch issued a warning that it was going to be a humanitarian catastrophe and gave examples of aid workers being pulled out from areas where people were dying and so on. You can not mention this. Any mention of this brings the same hysteria, as criticizing the bombing of the TV station. So it's unmentionable, it is a Western crime and therefore it was legitimate. Let's just suppose that Al Quaida blew up half the pharmaceutical supplies in the U.S., or England or Israel or any country in which people lived. Human beings, not ants, people. Fine. Can you imagine the reaction, we'd probably have a nuclear war, but when we do it to a poor African country - didn't happen! Not discussed, in fact the only issue that is discussed if there is discussion is whether the intelligence was correct when it claimed that it was also producing chemical weapons. That is the only question. Mention anything else, the usual hysteria, and tirades…This is a very disciplined, Western intellectual culture is extremely disciplined. And rigid. You can not go beyond fixed bounds. It's not, you know, it's not censored, it's all voluntary but it's true and it's not, incidentally, not free societies like this. In fact the third world countries are different. So take, say, Turkey, half third world; I mean in Turkey, the intellectuals, the leading intellectuals, now best known writers, academics, journalists, artists I mean they not only protest atrocities about the Kurdish massacre, they protest it constantly, but they were also constant in carrying out civil disobedience against them. I also participated with them sometimes. And they go publish banned writings which reported presented them to the Prosecutor's Office, demand they were prosecuted. It's not a joke, you know, facing… sometimes they are sent to prison, that's no joke. There's nothing like that in the West. Inconceivable. When I am in Western Europe I hear them telling me Turkey is not civilized enough to enter the European Union. I burst out laughing! It's the other way round. [crew]: This is the last question. [b] OK, two more quick questions; one: you mentioned the democratic movements in various countries. There was of course a promising democratic movement in Serbia before and, of course, during the bombing. And people like Wesley Clark had claimed that this bombing would be of benefit to the anti-Milosevic forces, when it of course turned out to be a disaster. Was this a sincere evaluation on behalf of NATO? Well, I can't look into their minds. When you commit a crime it is extremely easy to find a justification for it. That's true of personal life; it's true of international affairs. So yes, maybe they believed it. I mean, I think there's convincing evidence that the Japanese fascists believed that they were doing good when they carried out things in the Second World War. John Stewart Mill surely believed he was being honorable and noble when he was calling for the conquest of India right after some of the worst atrocities which I mentioned, you can easily believe you are noble. I mean, to me it's obvious that it was going to harm the democratic movement, I heard about it and I couldn't get much information but it was obvious that it was going to happen. I mean it is happening right now in Iran. There is a democratic movement in Iran, they are pleading with the United States not to maintain a harsh embargo, certainly not to attack, it is harming them, and it strengthens the most reactionary violent elements in the society, of course. First of all, what do you see as an appropriate, realistic solution for the final status of Kosovo and how does that differ from what the United States is now promoting? My feeling has been for a long time that the only realistic solution is one that in fact was offered by the President of Serbia I think back round 1993 [Chomsky is referring to the proposal of former Serbian President of Yugoslavia, Dobrica Cosic], namely some kind of partition, with the Serbian, by now very few Serbs left but the, what were the Serbian areas being part of Serbia and the rest be what they called "independent" which means it'll join Albania. I just don't see…I didn't see any other feasible solution ten years ago. Shall we wrap up? Professor Chomsky, thank you very much.